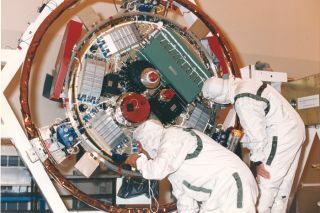 NASA technicians at the Jet Propulsion Laboratory inspect and repair damage inside the Huygens probe before its successful launch in 1997. In this historical photo from the U.S. space agency, Jet Propulsion Laboratory (JPL) workers examine the Huygens probe after removal from the Cassini spacecraft in the Payload Hazardous Servicing Facility (PHSF) at KSC. The spacecraft was returned to the PHSF after damage to the thermal insulation was discovered inside Huygens from an abnormally high flow of conditioned air. The damage required technicians to inspect the inside of the probe, repair the insulation, and clean the instruments.